Disappointing comedy that gains points for ambition but fails to provide a decent plot, interesting characters or any real laughs. Directed by Johnny Daukes, Acts of Godfrey is the second film in recent weeks (the other being X: Night of Vengeance) to open with a full-frontal shot of a completely naked man. 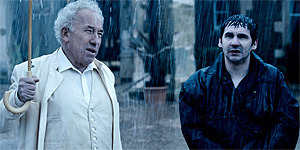 That man in this case is depressed salesman Vic Timms (Iain Robertson) and after the film opens on him getting soaked as he stands naked outside a posh-looking hotel, the film flashes back to discover how he got there, with all-seeing, ever-present God (Simon Callow) – calling himself Godfrey - narrating the story and all the dialogue being spoken in rhyming verse. Attempting to prove to the audience that he controls human destiny, Godfrey (who appears, variously as a barman, commissionaire and gardener) meddles in the lives of all the attendees of a self-help course who have gathered at the hotel for the weekend. These include: boy band manager Jamie (Michael Wildman), conman Malcolm (Harry Enfield), power hungry Mary (Myfanwy Waring), bombshell Jacqui (Doon Mackichan), quiet Gita (Shobu Kapoor) and two thuggish goons (Jay Simpson and Ian Burfield) touting a Viagara-like drug called Poke. At the very least, Acts of Godfrey deserves points for ambition and the fact that it sees its rhyming couplets conceit right through to the end. That said, it's all very well for a film to be spoken entirely in verse, but the rhymes are frequently badly written (“I'm Jacqui from Romford, I don't mess about/I sell Spanish villas to villains with clout”) and occasionally poorly delivered by the actors, almost as if they were unrehearsed and reading the script for the first time on camera. The script is all over the place and the characters are either painfully dull (it's impossible to care about Vic, for example), paper-thin caricatures (Malcolm, the thugs) or extremely annoying (Godfrey, Mary). Similarly, there's no real focus to the plot, so Daukes resorts to other distractions such as song-and-dance numbers and comedy cutaways, none of which really work. More than anything else, the film lacks a sense of fun – it was obviously conceived as a fast-paced knockabout farce with witty lines and a series of visual gags, but it's continually let down by the script, direction and uneven performances. Acts of Godfrey has a certain novelty value and can't be faulted on its ambition, but it fails to deliver any decent laughs and never really gels together into a satisfying whole.